Legendary horror icon Bruce Campbell stars in the final season of Ash vs Evil Dead: Season 3. 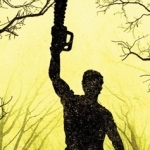 Experience the final season of the hilarious, critically acclaimed, most-watched comedy series on Starz that follows-up the classic horror film The Evil Dead. Alongside Campbell, Ash vs Evil Dead: Season 3 also stars Lucy Lawless, Ray Santiago, Dana DeLorenzo, and newcomer Arielle Carver-O’Neill. Season 3 features Ash, who – having gone from urban legend to hometown hero – discovers that he has a daughter. And, when Kelly witnesses a massacre with Ruby’s fingerprints all over it, she returns to warn Ash and Pablo. Ash Vs. 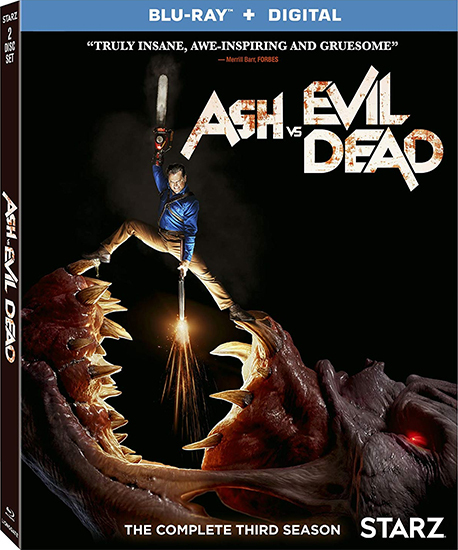 Evil Dead: The Complete Third Season releases on Blu-ray and DVD on August 21, and we have a copy of the Blu-ray to give away to one lucky winner! You have from now through midnight Eastern time on the night of Monday, September 3, 2018, to get your entries in. Take a look at the form below to see all the ways you can enter.